Overall this has been rather an odd month weather wise. It has been a bit warmer than usual but this was down to the last two days when temperatures reached 70oF and some places in the South West experienced their hottest May temperatures on record. Earlier the wind and rain delayed progress out of doors but suited the begonias in the greenhouse. (A) The first basal cuttings of the year were taken on the 1st. of the month. These are taken the traditional way by rocking the stems off the tuber with thumb and forefinger and hopefully with some root. The medium I use is coir with a generous amount of Perlite. The block seen on the top of the bucket is soaked in approximately 5 pints of water, left for an hour or so, and then given a thorough stir to break down completely. 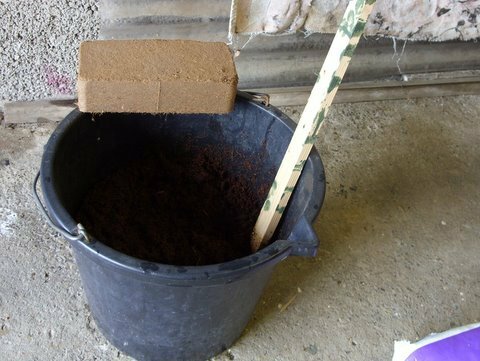 (B) This is the amount of compost generated from one block. 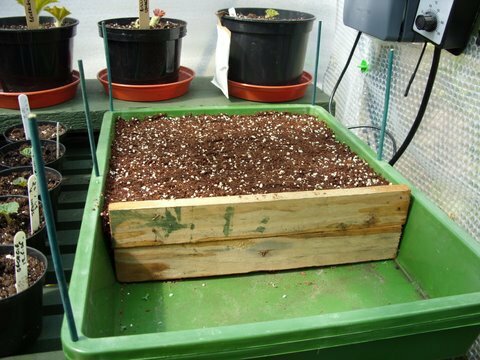 I find that the earlier cuttings require heat so I use a propagator to start with. This is surprising as most of them have rootlets. I generally use no hormone rooting powder except on some pendula cuttings and this rarely these days. If you use too much powder or gel, the cuttings rot. If you must, use very, very sparingly. 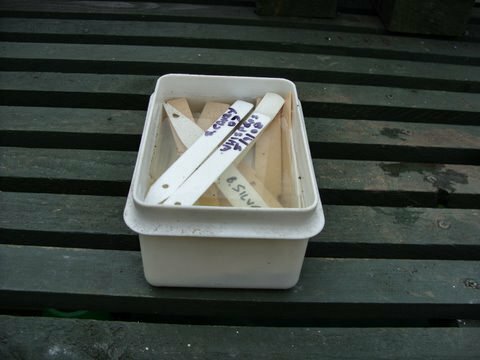 (C) Cuttings now inserted in the compost. The leaves are trimmed down to the size of a one pence coin or smaller. If any show signs of flagging I invert a plant label and push this through the leaf to hold it stable. 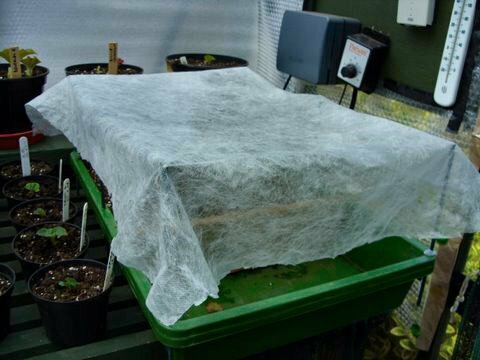 (D) The propagator is then covered with fleece ensuring that it does not touch the cuttings in any way. 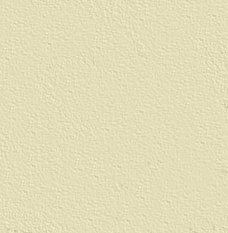 It is essential to keep damp, but not wet, and it is fatal to let the coir dry out. A tip, I tend to spray with a hand spray every time I go in the greenhouse – a sort of manual mist sprayer. (E) The back staging has now been inserted with the “drinks bar” underneath. I use rain water from the water butts at the rear of the greenhouse. This is stored in watering cans to ensure that the water applied is at room temperature. The rear door is open at all times and is covered with shade net to stop fliers, i.e. insects and birds gaining entry. Having a back door installed in the greenhouse was a great decision. It helps to ensure air circulation at all times. (F) The second weekend of the month saw Blackmore & Langdon's Open Day at Pensford only a few miles from Nailsea. This is a regular on the begonia calendar. Here is my friend Tony Willoughby inspecting blooms in the show house. Met up with Gary Dando, John Chiswell and Don Dewey but missed many other NBS members who visited over the three days. Incidentally, B&L picked up another gold for their display of begonias and delphiniums. (G) Here are two trays of semperfloren begonias. These will be used for bedding in some parts of the garden. They were purchased as plugs from a local garden centre and have made good growth. 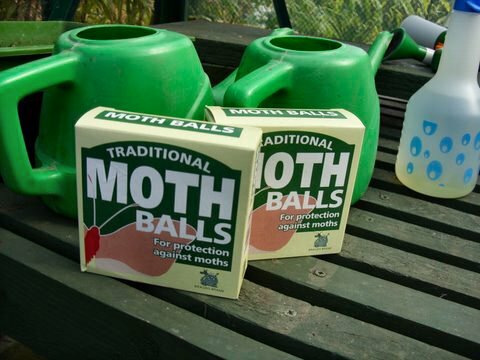 (H) Moth balls, the first line of defence against vine weevils. I started using them some three years ago and now many other growers do likewise. They are scattered around the greenhouse floor and also placed in saucers amongst the plants. 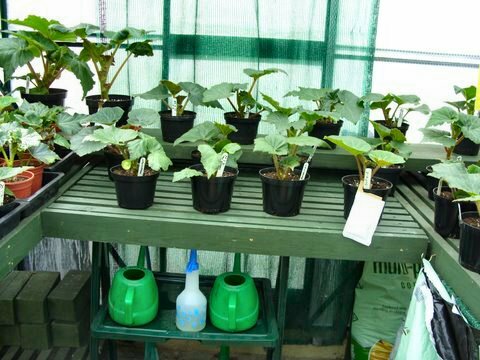 Their main use is for outside the greenhouse where all baskets and tubs are treated. Later Provado is utilised but I am convinced that moth balls deter the little blighters in the first place. How the price has escalated over that time. Initially they cost £1.22 for a box of 30 balls, and this has now risen steadily to £2.24 this year, or 7.5p per ball. However you can obtain from a major national chain at their special price of £3.29! You can still, I am told, obtain from certain pound shops but I’ve never seen any. Geoff Porter tells me that Northern Ireland is the place to be, as you can obtain balls imported from the USA at just £1 for 50 balls. 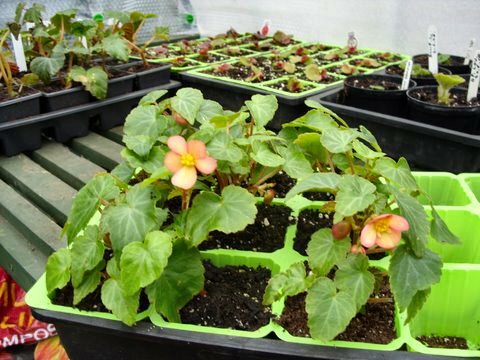 A combination of weather and back trouble has meant that no baskets or troughs have been planted out as yet, many of the begonias are overdue for staking and things are lagging a bit. However, with both on the mend, watch out next month. 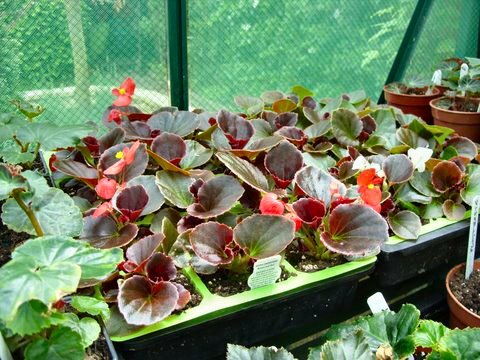 It’s all happening this month in the “begonia world”. So much to be done and waiting for plans to come to fruition. The weather was extremely hot towards the middle of the month but by the end there was a very cold wind with a ground frost at night. Just ask my potatoes on the allotment what they thought of that! (A) The 5th April saw the South West Area’s annual meeting in Nailsea. A great chance to meet up and exchange ideas and views. 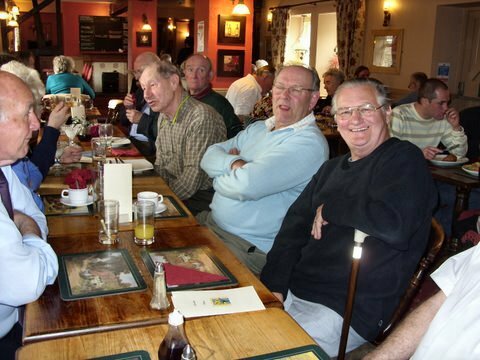 Many of us meet up for lunch, before going up to Grove Sports Centre for the meeting. L to R Mike Ball, Chudleigh, Devon, Mike Osborne, Camborne, Cornwall, Gary Dando, Area Rep, Shepton Mallet, Somerset and Dennis Need, our speaker from Merseyside, a combined mileage of approaching 1,000 to be with us on the day. What dedication. A good time was had by all. Others attending came from throughout the SW with visitors from South Wales and the Midlands. 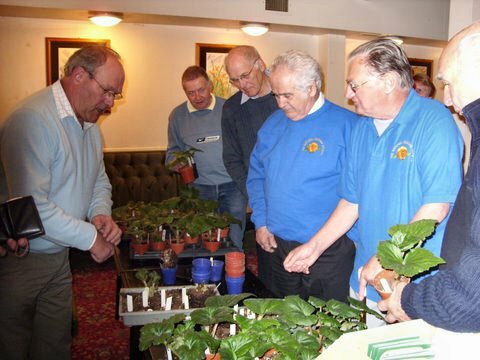 (B) Dennis Need travelled down from the North West to be with us and his talk on multi floras was very well received by approximately 50 attending. 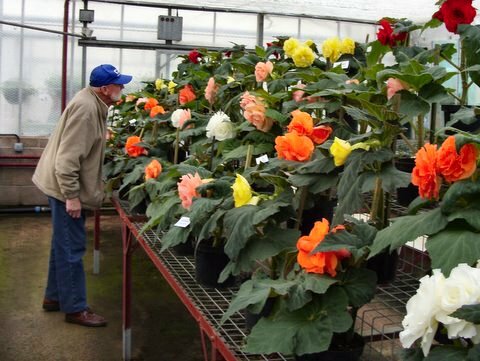 It shows there are other begonia varieties than the tuberous show varieties to be considered. An integral part of the afternoon was the plant/tuber sale. The Area is grateful to all who contribute, especially John Chiswell and Gary. Here you see the sale in full swing. The proceeds were shared by the Area with the recently formed South Wales Group. (C) John Chiswell brought 400 sachets containing Amblyseius cocumeris to the meeting and all were purchased. It seems that at last the environmental prevention and treatment for Tarsonemid mite is catching on. I introduce my 10 sachets and these last for 6/8 weeks. I intend to obtain another supply in early June and that will see me through the growing season. Can you afford not to take this precaution? I have seen the devastating effect that mite does to the plant and may I say the growers as well. It is heartbreaking if you are affected. (D) The first flowers of the season. These are Dainty Dancer plug plants developed by Dennis Need and obtained from him at our meeting. . Another one that is down to Dennis is Peardrop”. They will make a good display in baskets, troughs and for general bedding and will be on sale at selected garden centres. I intend to use in a long trough under the kitchen window. (E) This is the first potting on of a cutting tuber of Apricot Loveliness taken on 27th June, 2008, planted on the 22nd January this year and now re-potted. The roots are just filling the 3½” pot and it has now been transferred to a 5½” half pot. 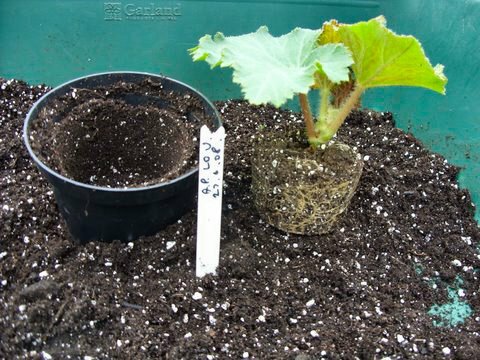 I use the smaller pot to make a template, put compost around it, and the plant just drops in with no root disturbance. (F) The 22nd April was a significant day, or particularly the afternoon. The heat was intense so I had to move quickly to shade the greenhouse. Until then I had relied on the bubble wrap for shading. I use shade netting and it took around 10 minutes to fix with four ties on each sheet. 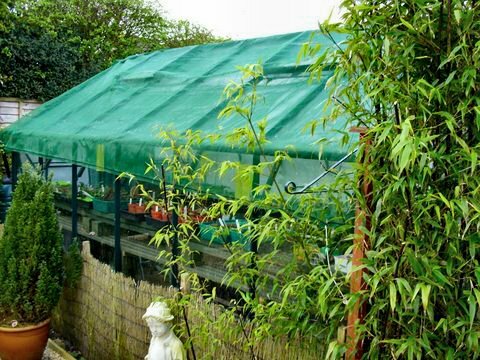 It withstands all the gales that nature can throw at the greenhouse and as it is an integral part of the garden, to paint it white would be an eyesore. This system is so much easier and it works. (G) My system of cleaning off labels. Soak them for 48 hours in a mix of 50/50 water and bleach and most will be clean and ready to use. Less laborious and more efficient then using a scouring pad. It doesn’t work on pencil markers though. 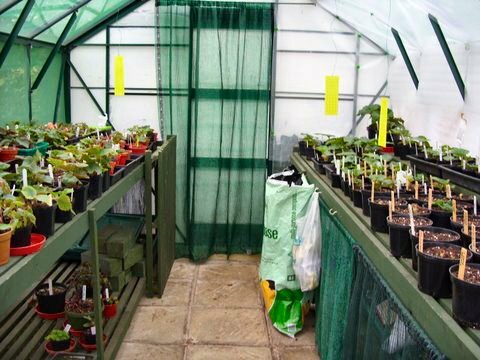 (H) The interior of the greenhouse, at the end of the month, now totally devoted to begonias. Pendulas, multi floras et al on the left and tuberous varieties on the right. I have introduced yellow sticky traps. Strictly against the rules as they will certainly catch a few of the mite predators, but so what, there’s plenty to go round. My aim was to grow 36 plants this year and a quick count revealed 103! Certainly some culling required to achieve my aim. They are all looking very healthy and I am, as always, looking for a good season, as we all are. So far I haven’t taken any cuttings this year. 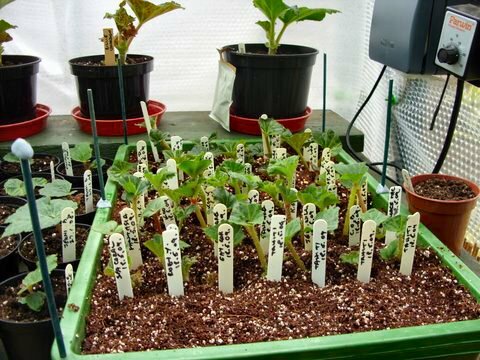 I concentrated on growing the miniscule cutting tubers, some of which have made remarkable progress. I delayed starting my main tubers, some only going in in the early part of this month. I hope that next month I will be in full swing taking cuttings, but intend to be much more selective than last year as I do not really have the space to do them all justice.